Paris, Tel Qu'Il est Aujourd'hui. This is an extremely attractive tourist map or plan of Paris, France from about 1900, issued by L Joly. Centered on the Seine River, it covers embastilled Paris as contained in the Thiers Wall as well as its immediate vicinity, including the Bois de Boulogne and Bois de Vincennes. It reflects the transformation and modernization of Paris under Napoleon III and Georges-eugene Haussmann. The map is color coded and divided into 20 arrondissments (20 administrative districts), detailing individual buildings, streets, monuments, railway lines, gardens and palaces. Shows exceptionally remarkable attention to detail in the public gardens where subtle expressions of landscape design are apparent. 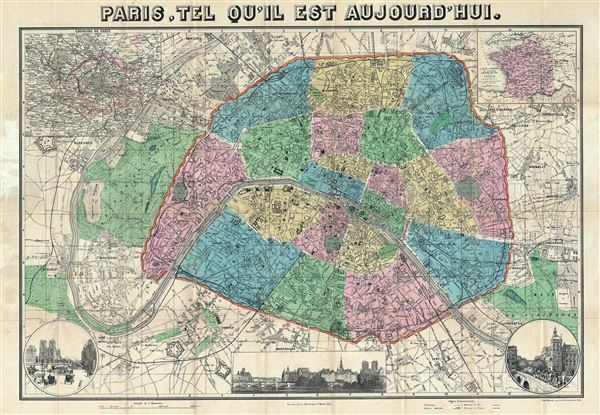 This map was issued in around 1900, after the construction of the Eiffel Tower, identified here. The top left quadrant includes an inset map of the environs of Paris and another inset in the top right quadrant features a map of France. Three beautiful illustrations featuring views of Paris are included along the bottom border. This map was engraved by Dufrenoy and issued by L. Joly.